Whether or not “two great parties” is indeed the “greatest political evil,” I have personally come to the conclusion that there is no political “team” I feel comfortable joining. And trust me, I’ve tried. At various points in life I’ve called myself a Democrat, or a Republican, or a Libertarian, but at some key juncture I always find myself disagreeing with a few core principles of one of these factions. I guess what I’m opposed to is fundamentalism in all its various forms. Our views should be fluid, in my opinion. Too many people lock onto an ideology which becomes part of their personality, their very identity. This is silly and hazardous. It really feels like nuance and rational debate are disappearing faster than the American middle class. We are quick to turn to shouting and name calling and sometimes even violence when faced with political opinions that differ from our own. We often view those who change their minds or political affiliations in a negative light. Anyone who knows me also knows my feelings about organized religion. It’s dangerous, and serves mostly as a control mechanism by focusing on our fear of death (or more accurately, our ego-driven fear of non-existence). And while there are still plenty of religious zealots in the world, it seems to me that we are more and more replacing our religious fundamentalism with political fundamentalism. Our churches are becoming our political parties, the politicians—our clergy—insisting that “our way is the only way.” And we’re willing to fight for what we believe to be the “Truth.” For evidence, one must look only as far as your Facebook or Twitter profile, or, god forbid, that horrific digital battleground where civil discourse goes to die—the YouTube comment section. The vitriol and politically-charged hate spewed in these social media locales is indeed a sight to behold. It’s amazing what some people are willing to say when protected by the cloak of anonymity that they would never say in a face-to-face conversation. But that’s a topic of discussion for another essay. Many Independents, Libertarians, and Greens are fond of announcing that the “two-party system” is destroying our country. To be sure, there is some truth in this statement. 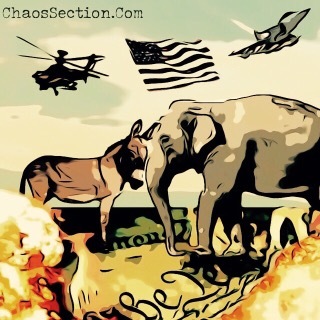 The Donkeys and Elephants have held political power in this nation for far too long; but I’m not convinced that replacing Republican fundamentalists with Libertarian fundamentalists, or Democrat fundamentalists with Green Party fundamentalists, is the answer either. As you’ve often heard, “power corrupts.” When a political party comes into power, that party’s main mission is then to retain that elevated status. The needs of the electorate and the commoners come second to the survival of the Party. I can’t and won’t speak for anybody but myself, but personally, my political and social beliefs don’t fit neatly into any party platform. I’m a combat veteran who owns guns, but believes in reasonable, rational gun control. I’m a parent who is pro-choice, but still recognizes that a healthy fetus, left alone and not aborted, would eventually become a human being. I believe that the First Amendment is the greatest piece of legislation ever penned and should be protected at all costs, even for those who use that liberty to espouse ideas that I find abhorrent. I believe that we have massive income inequality in this country, but I also believe in fair competition. I believe that universal healthcare is a good idea and that if we can find the money to go to war, we can also find it for our people’s health care needs; but I also believe that capitalism drives technological advances and creativity. I’m pro-immigration, but—while at least philosophically recognizing the absurdity of arbitrary, imaginary lines drawn on a round planet determining where other sentient beings with the exact same biological makeup as ourselves are permitted to travel—I also see the current impracticality and dangers of wide-open borders. Perhaps some of my views are inherently contradictory. But as Walt Whitman so elegantly wrote, “Do I contradict myself? Very well, then I contradict myself. I am large, I contain multitudes.” To be clear, I’m not attempting to compare myself or my intellectual ability to Whitman, nor do I necessarily believe that I am “large,” or “contain multitudes”; but I think we all understand what Walt was saying. I also don’t see this as cognitive dissonance. Seeing both the real-world shortfalls of open borders in our current geographical reality, and the absurdity of borders in general, is not the same as “simultaneously holding two or more contradictory beliefs.” It’s nuanced—and, I hope, realistic—thinking. We’ve now reached the point where I tell you that I don’t have any solutions or answers to our partisan problem; at least, no practical solutions. I don’t believe that we should “scrap the whole damn system,” as some of my more anarchistic-minded friends do. I believe we Americans have created a representative system of governance which can rival any through history, but just because the foundations are solid doesn’t mean we can’t evolve and improve upon it. In fact, I believe we must continue to evolve our ideas of governance should we wish to celebrate our third centennial of this great American experiment. And while an anarchistic philosophy is appealing, I don’t think, faced with the sheer numbers of our ever-expanding population, that it’s a viable alternative. I would love to see a world where political parties don’t exist, a political environment in which candidates run on an individual platform where their stances could be judged and weighed in the marketplace of ideas. Much like Mr. Adams, I believe that party control and dominance could be our downfall. But my “party-free utopia” isn’t likely to come to fruition anytime soon, nor do I believe that the elimination of political party strongholds is in and of itself some sort of panacea. Which, of course, brings us to Donald Trump. *In the aforementioned podcast, Carlin also breaks this sentiment down in a much more clear and concise manner than I am capable. President Trump, while a Republican (currently) in name, is an outsider. Unfortunately, he’s not the outsider I have been hoping for. Putting aside any political views he may hold, I think we can all agree that he is a narcissistic, power-hungry, egotistical authoritarian—a description that one could argue to be the definition of the very personality type that we Americans would not want to lead the government of the Unites States, the most powerful player on the world’s stage. Over the last several decades, Congress has ceded more and more authority to the executive office, and now we are seeing what happens when someone comes into power who is willing to wield those unchecked powers to further his own agenda. We might be in for a bumpy ride. A bumpy ride that we voluntarily, if perhaps naively, boarded. From an all-out assault on the press and free speech, to open attacks on the judicial system and the justices appointed to uphold it, I think that most of us can agree that we are in largely turbulent and uncharted waters. We are in a strange political climate for sure—an age where facts are now alternative versions of truth, and established scientific theory has become little more than “liberal conspiracy” to many of our citizens and to the politicians we have entrusted to write and enforce policy at the highest level of government. And how did we get here? There isn’t a simple answer to this question, as it’s obviously a complicated combination of actions, missteps, and intentions, both good and bad. And it’s in part due to the pendulum of political correctness swinging in the opposite direction. But our current state of affairs can, to some extent, be traced to political parties. We Americans have given up on electing the most qualified people to represent us in Washington D.C. We’re instead all too happy to check the box next to the name of our candidate that happens to have an R or a D next to it on the ballot. We’ve given responsibility to the parties, trusting that the people who write the agenda and platform of our preferred party will have our interests at heart. But going back to Trump—there is some hope. The very fact that he was nominated and elected in opposition to the plans of both major parties is a good sign. Assuming we survive the next four years, he has shown that it is possible for a political outsider to gain a foothold in the current electoral stranglehold. If only the Dems had recognized this, we might be in a far different position right now. In 2016, the Democrats chose to ignore the anti-establishment climate in America to run one of the most disliked and deeply-imbedded establishment candidates in history, despite the fact that they had the perfect answer to Trump in a Senator from Vermont. Bernie Sanders attracted the same type of voter, desperate for an outsider candidate, that Trump did—the major difference being of course, that Sanders was largely viewed as trustworthy, honest, and genuine, in direct opposition to President Trump’s qualities. But the DNC wasn’t hearing the people. They plotted and conspired and rallied around the establishment base and ignored the voices of their vast, working-class constituency, an error that likely cost them the election and pushed the most divisive and jingoistic candidate in some time into the highest office in the land. And given the recent results of the election for DNC leadership, it appears that the party still hasn’t learned its lesson. Not that we should be surprised. This is what happens with political parties. When they are allowed to take control, the desires of the masses are pushed aside. The party comes first, always. So where do we go from here? I don’t know. We’ll ride out these next four years the best we can and see what happens. Maybe things will change for the better in 2020. Maybe not. But whatever the short-term solutions may be, I believe that any long-term solution to our current challenges won’t start with a capital D, or R, or even a G or an L. It will start with an electorate waking up and realizing that an established political party platform will never solve our problems. It will only serve to drive deeper the wedges that divide us. Please feel free to send your love letters and hate mail using the form below. ← Society is Fucked. Fix Your Own Lives. Spot on as usual brother. I suppose some might consider that a biased assessment, and perhaps there’s a case to be made for that, but considering how many discussions surrounding various topics we’ve had that couldn’t be be summarized with “yeah, me too!” I think it’s less bias and more a simple assessment of the thoughtful manner in which you develop your perspective. Be any of that as it may there are a couple of points I’d like to raise in the “where do we go from here” category regarding making our democracy more representative. First – Rank order (or standard transferable) voting. Any politician, party, or person, who believes they have persuasive ideas that serve the nation has every reason to support this (and to me it is deeply telling that so few elected officials will even openly discuss this, let alone support it). Second – Buying office, or rather the end thereof. The ‘Citizens United’ verdict and its kin need to follow the poor Dodo into obscurity and silence. Without delving into the psychology of how groups effect personal behavior (though both Philip Zimbardo & Zepher Teachout have interesting books worth picking up), it is simple to say that giving inherent advantage to any minority within a population inherently increases the potential for a distortion of the democratic process away from representation of the people as a whole.